Throughout history, American women of African descent have made remarkable contributions to science, invention, technology, and medicine. They’ve made fascinating discoveries and have created many useful tools. Despite these accomplishments, neither the libraries of the world nor the Internet reveals much information about these women. Given the social and economic barriers they have faced before and after slavery, it is impossible to know to what extent African-American women have contributed to these fields. Early in America’s history, most female inventors could not receive patents in their own names. A patent is legal proof that a certain person created an invention so that others cannot claim that they produced the same item. Prior to 1865, it was unlawful to issue patents to enslaved people and only slave owners could receive a patent. 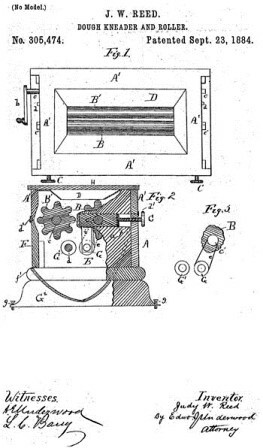 After the American Civil War (1861-1865) and the Emancipation Proclamation (the executive order issued by President Abraham Lincoln on January 1, 1863, that made the eradication of slavery an explicit war goal), African-American inventors could apply for and receive patents for their inventions. This was possible because ethnic identity was not a part of the patent application. Despite this change, many women still did not get the credit they deserved. Many of their inventions were recorded under the names of their fathers, husbands, brothers, and other males. Though we’ll never know if some of these women ever married, had children or invented other things, we can try to give them the credit that is due them. If you’ve ever lived without a washing machine, then you’ll appreciate the woman in today’s spotlight. Ellen F. Eglin of Washington D.C. made her living as a housekeeper and in the 1880s, she invented a special type of clothes wringer (an ancestor of the washing machine). In a different time and place, Eglin might have received a fortune for her invention, but she sold her idea to an agent for $18.00 because she feared she wouldn’t be able to find a manufacturer to produce her invention. Photo courtesy of Sue Machado’s Weblog. The publisher of the magazine befriended Eglin and tried to help her patent her invention. Eglin even attended a reception given by President William Henry Harrison for inventors. Though she later worked as a clerk in the census office, there is no evidence that she patented her second invention. Furthermore, what it was remains a mystery. Before the invention of the clothes-wringer, women washed their clothes in rivers or other bodies of water using rocks and stones. Others scrubbed the fabrics with their hands. Soap, washing boards and tubs made things easier, but Eglin’s clothes wringer aided in removing the soap and the water and to some extent, the dirt. Although Commercial “washing machines” or “wringers” existed as early as 1861 in England, American women either had no knowledge of or access to these machines. Eglin’s clothes wringer was a product of her imagination and it saved women hours of back-breaking work. Unlike Eglin, many other black women were able to patent their innovations. 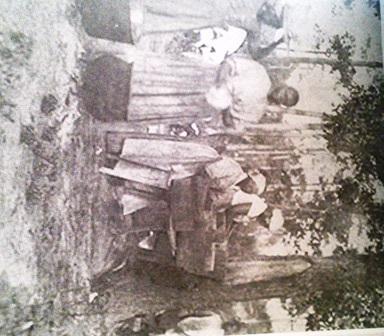 Sarah Boone received a patent for the improvement of the ironing board in 1892. She invented a narrow board with a padded cover and collapsible legs. It also had a special sleeve-ironing board which enabled the user to press the inside and the outside of coat sleeves. The curved-waist seams of male and female garments could also be pressed. Judy W. Reed patented an improvement for a hand-operated dough kneader and roller on September 23, 1884. At the time, making bread was a time-consuming daily task. Unlike existing dough kneaders, Reed’s device allowed the dough to mix more evenly and the covered container kept the dough clean and protected. Reed was the first African-American woman to be awarded a patent. Illiterate, she signed her name with an “X.” During slavery times, it was unlawful to teach an enslaved person to read and to write. Any slaves found reading, writing or teaching others, were harshly punished or killed. Anna M. Mangin, of Queens, New York, created a special kind of pastry fork in 1891. 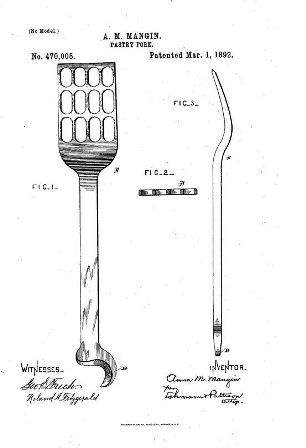 The fork was patented on March 1, 1892. Before this invention, dough for pastries and pie crusts were made by hand. Thanks to Mangin’s fork, cooks could mix butter and flour together without touching the ingredients. The fork was also used to beat eggs, mash potatoes and prepare salad dressing. Furthermore, Mangin’s smaller fork allowed women to eat pastries and other desserts while holding a plate in one hand. Many of these early imaginative creations were developed to ease the burden of a woman’s work. With freedom and access to higher education, some of these ingenious African-American women made discoveries that have helped change the world. 1Sullivan, Otha Richard. Black Stars: African American women Scientists & Inventors. San Francisco: Jossey-Bass. 2002. 7.